Do you put off cleaning your makeup brushes as long as you can? Do you find the task of cleaning your brushes to be tedious? With StylPro, an innovative brush cleaner/drier, you can have your brushes looking like new in ten seconds. Keep reading to learn more. At one point last year, contouring became one of the most hyped about beauty techniques. A plethora of contour kits, from creams to powders, hit the market and I bought quite a few of them. I love the effect of a proper contour… the sculpted cheekbones, the defined jawline. It just changed the way I did my makeup. We are absolutely loving the makeup collaboration between Urban Decay and Gwen Stefani…they just nailed it! We think this collection is so cool that we just have to give away one UD x Gwen Stefani Blush Palette and a 714 Lipstick to one lucky Pampadour reader. The blush palette contains 6 gorgeous shades of blush, bronzer and highlighter that are versatile enough for any skin tone and the lipstick is the perfect shade of matte red. All you need to do is tell us how wearing red lipstick makes you feel. Studies have shown that it has way more of an impact on our mood than most of us would guess and we’re curious what it means to you! If you’d like to discover more about the products, check out Temptalia’s swatches of the blushes and Makeup and Beauty Blog’s lipstick swatches. Who wouldn’t want this awesome prize? Good luck, beauties! Pampadour’s One of the Top 50 Beauty Blogs…See Who Else Made the Cut! It’s true. I’m obsessed with lashes. To me, no makeup look is complete without a good coating of mascara or some fabulous false lashes. If I’m staring at your eyes, I’m probably checking out your lashes. Yep. Sorry. It’s not you, it’s me. I have never had the luxury of having beautiful skin. From pimples in my teens and thirties to pimples, wrinkles and dark spots in my 40s, I’m always looking for products to help my flawed skin look its best. I have adopted a pretty good skin care routine, and while my skin does look better, it’s not where I’d like it to be. This is where makeup comes in. I have always loved the airbrushed makeup look. When I would hire a makeup artist to make me up for special events, I would always request airbrush makeup, especially for the foundation. It gave me a beautiful flawless look with a subtle glow that never looked caked on. A few years back I purchased a Temtpu Airbrush System because I wanted to be airbrushed all the time. It came with individual pods of foundations and blushes. I used it for a few months straight, and then it lost its allure because it began giving me intermittent problems. The pump wouldn’t always work like it should. It’s currently sitting somewhere at the bottom of a closet. Since then I have found a few foundations, brushes and my beloved BeautyBlender to give me an airbrushed look. Recently, I was contacted by Luminess to see if I would like to review the Luminess Air. I gladly jumped on board as I am completely obsessed with beauty products. They were kind enough to offer a discount to our readers which you will find at the end of the post, so keep reading! Check Out My Interview with Beauty Academy! I was recently interviewed by Beauty Academy as part of their Expert Interview program. Click HERE to read my interview where I discuss my passion for beauty, what I predict will be the biggest trends of 2016 and more. Check it out! Okay, we’ve all been there. You’re at a private party in someone’s home, and your stomach starts rumbling and you know things aren’t looking good. Maybe it was the spicy cheese puff you just downed or the spiked punch you so eagerly chugged, but you race for the bathroom and luckily make it just in time…. Beauty lovers count down until Cannes time. Every star on the red carpet has one collective goal – bring the glamour! Follow the jump for our roundup of the best beauty looks this year…and make sure to log on to Pampadour for updates, how-to’s and more. Blake Lively has proven to be quite a beauty chameleon on the Cannes red carpet. She consistently surprises us, trying new hairstyles and makeup looks, but one thing always stays the same: she RADIATES confidence. The Queen of Cannes 2014! My personal favorite look, Blake channeled Grace Kelly to perfect with this chignon, red lips and, of course, diamonds. Sophistication at its best. Karlie Kloss kept her makeup simple and let her dress do the talking at Cannes. Obsessed with the silver smoky eye Adele Exarchopoulos rocked at the Grace of Monaco premiere. They say it’s a faux pas to match your eyes to your outfit, but if there was ever a beauty risk-taker who could pull it off, it’s French style icon Lea Seydoux! From the Veronica Lake finger waves to the crimson lips, Jessica Chastain’s look here exudes class and glamour. Bye bye pixie! JLaw’s hair is growing out and we love watching her try out creative new hairstyles in the process. One word to describe Freida Pinto’s look at the premiere of The Homesman? Elegant. Complete with sweeping ball gown, Sonam Kapoor (the face of L’Oreal India) looked positively regal on the Cannes red carpet. This is how a supermodel does Cannes! Adriana Lima looked flawless, per usual, with a super-slicked back updo and red lips. Purple (along with emerald green) truly brings out the best in redheaded beauties like Jessica Chastain. She looks ethereal at the Foxcatcher premiere. Cheryl Cole is giving us major Brigitte Bardot vibes with this big, beautiful bouffant. With a messy fishtail side braid (the new ‘It’ hairstyle), smoky eyes and simple makeup, Eva Longoria proves why she’s one of the queens of Cannes. Actress Jess Weixler sported this intricately braided updo at the premiere of Foxcatcher. So gorgeous. The combination of Riley Keough’s bright hair and brick red lips is quite striking. 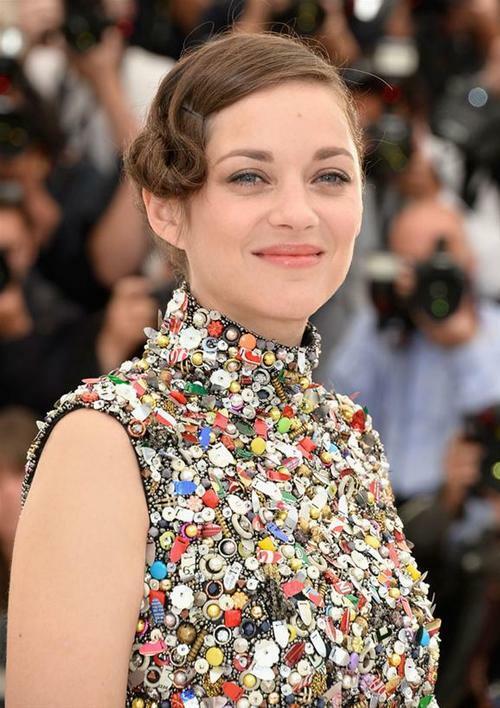 Love that little pin curl in Marion Cotillard’s hair and the muted makeup – Parisian chic at its best. As the weather gets warmer and we begin to break out the sunnies and shorts, and if you’re anything like me, you give your makeup bag a summer switch-up. Long gone are the days of heavy foundation and powdery blush – it’s too hot and your makeup will literally melt right off your face. Overhaul your collection with some fresh water-and-sweat-proof cosmetics. Read on for our summer must-haves – grab them in time for Memorial Day! Liquid foundation is one of my favorite products – nothing provides coverage like that, but during the summer you can visibly see it caking and melting off. Not cute. On top of that, most foundations don’t have SPF, which you must wear every time you step into the sun. In recent years, BB creams have become super popular, and with good reason! The super light creams are hydrating, melt-proof and contain SPF. Some of the most well reviewed on Pampadour are Smashbox and Maybelline’s. 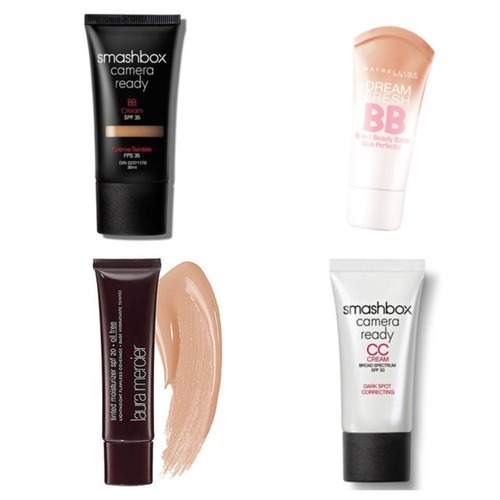 If you need a bit more coverage, go with the slightly heavier Smashbox CC Cream – it corrects dark spots and contains SPF 30! If your skin barely needs any coverage, go with a tinted moisturizer – Laura Mercier’s is a classic. If you’re anything like me, you need to wear concealer at all times. No beauty woe is worse than gorgeous eye makeup being overshadowed by unsightly dark circles. To ensure your concealer doesn’t fade away halfway through your beach day, go waterproof. We have two favorites – one higher end and one drugstore, both incredible. Make Up For Ever is on top of the waterproof game (we’ll get into their Aqua line a little later…), and this concealer is no exception. Long lasting, full coverage, oil-free, this will stay put through even the hottest of heatwaves. 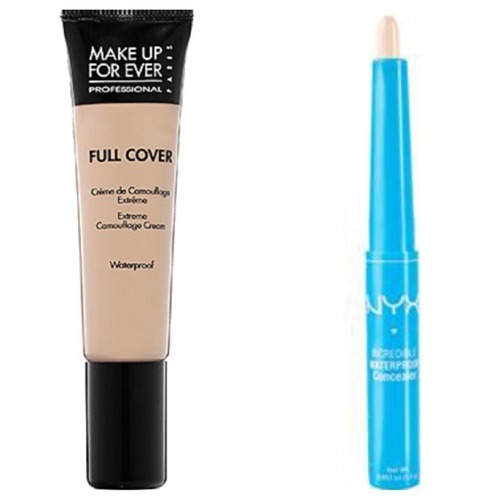 The inexpensive alternative is by NYX’s Incredible Waterproof Concealer and rings in at a wallet-friendly $5! Trust me, this will stay on even when you’re swimming laps in the pool…they don’t call it Incredible for nothing. 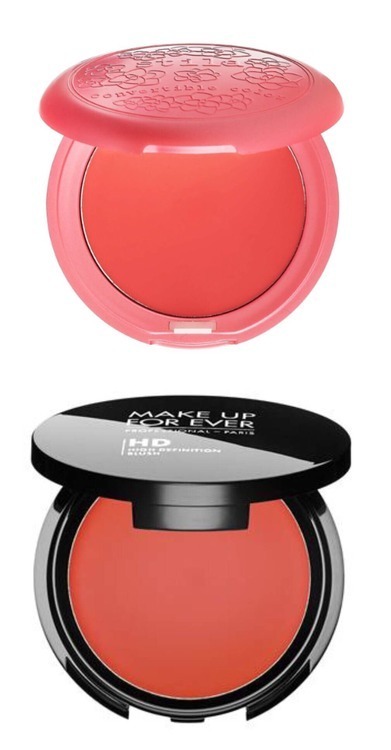 Not sure why, but many people are hesitant to try cream blushes. I guess it’s the mystery of the unknown – many don’t know how to apply it, how to blend, etc. (Hint: dot it on with your fingers! If you feel like you might’ve used to much, use a Beauty Blender or sponge to diffuse it a bit.) Cream blushes will sink into your skin and stay put – powder will feel heavy in the sweltering heat. Two classics that I’m using right now are Stila’s Convertible Color and MUFE’s HD Blush. The eyes have it! 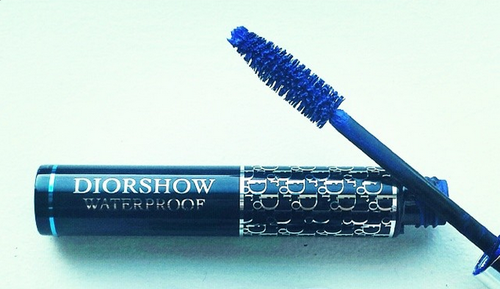 From mascara to shadows and liners, there are TONS of waterproof eye makeup options. In terms of mascara, nothing beats Dior. It grabs every lash, volumizing and lengthening. 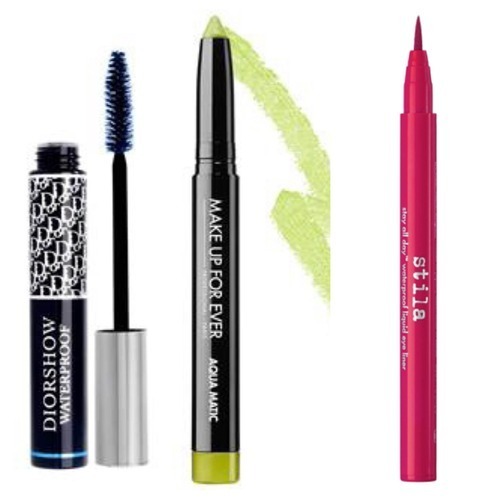 Grab the Azure Blue mascara for a fun twist. The new MUFE line of Aqua Matic shadow pencils is unbelievable: they glide on and stay on. Use the super pigmented, waterproof pencils as shadow or thick liner. On top of that, the color selection is gorgeous – ranging from funky neon colors to neutral everyday shades. As far as straight up liners go, Stila’s is pretty great. The famed Stay All Day waterproof liquid liner has definitely earned its name – seriously: go for a dip in the ocean and this stuff will not budge. Plus, they recently added fun colors to the range, including vibrant pink. So go ahead and sport it for a relaxing day in the sun! For much more product recs, tips and tricks regarding waterproof summer-ready makeup, visit PAMPADOUR!